History: Gigi did not race. 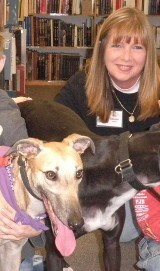 Gigi found a home with foster mom, Kris, and Greyhounds, Sophie and Hershey and Australian Shepherd, Tessa. February 25, 2011 update: Adopted! Gigi has been with me for 6 months now and I feel confident that she is ready for her forever home. She has made great progress over the past few months and is going to be a terrific companion as she grows into being an adult greyhound. She has mastered “sit” which she will gladly do most of the time without being ask especially when you have a treat or her food dish. She knows “down” and we are working on “stay” but that continues to be a challenge. She will “sit pretty” (straight up on her backside with paws in the air or around your arm) which is a little sloppy, but she gets big kudos for her efforts. She loves to play with a rubber kickball outside – notice I said play, since she does not retrieve at this point. She loves to run with it in her mouth and wants you to chase her, but that isn’t going to happen or I’ll never get her to understand “bring it”. When I do have the rare chance to kick it for her she is in heaven playing chase and then she runs with it in her mouth, drops it, trips over it, picks it up again and so the game goes. She’ll play the same game with a tennis ball or stick, but the kick ball is her favorite game outside. She also likes to play with a small baby inside the house and will bring it back to you when you’re indoors. Then she crashes and burns as is the nature of any puppy that plays hard. Once she has a nap, she ready to start all over again. She loves to go “bye bye” and rides very well in the car, laying down for the majority of the trip. She is still a little apprehensive about large crowds, small children and unfamiliar surrounds. Once she reaches her destination (currently a meet a greet venue) she is much more comfortable. I think Gigi will need to have another dog to play with and help lead her. 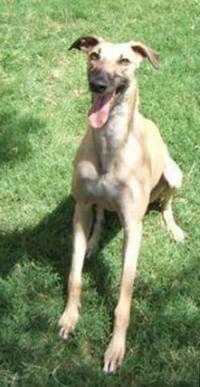 She is a smart girl and would love to meet you in her home environment where she is comfortable. Gigi has been with me since mid-April when she joined the TAGS family. 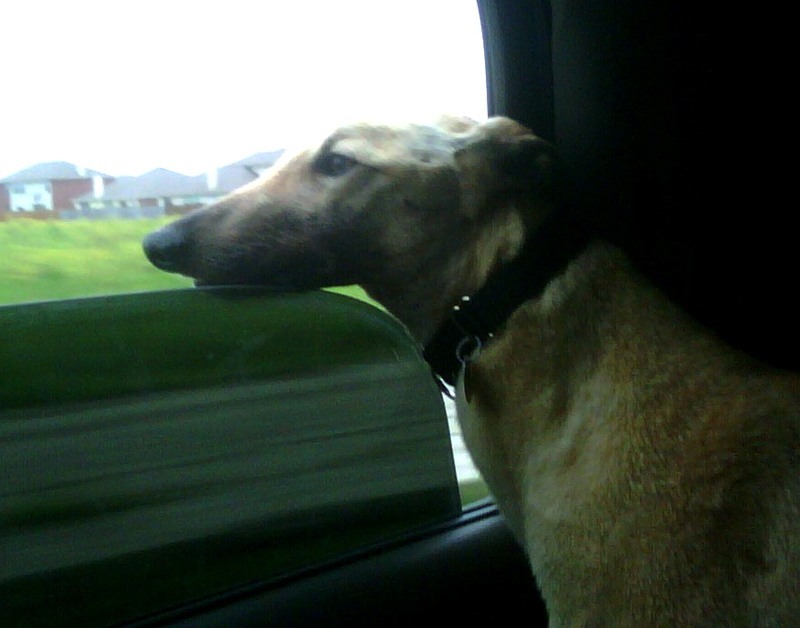 Gigi is a full grown greyhound, but she is still very much a puppy at only 18 months old. Gigi had the privilege of never racing on the track, but the alternative was being kept outdoors at the farm until she joined the TAGS family with very little handling (so “wild child” fit her perfectly for the first month or so). She came to us looking very much like a skinny blonde Labrador with her thick blonde undercoat. Through many hours of brushing, we managed to get rid of her thick undercoat and she has blossomed into a beautiful red fawn girl with darker markings on her face and along the top of her tail. Gigi is very treat motivated and that helps me with some basic training skills. In a very short time she has learned to “sit” even though she doesn’t hold it long for now (we’re still working on that), she will go into a “down” position and we are currently working on “sit pretty”. While her concentration level and focus are minimal based on her age she’s a smart girl and wants to please her humans. She has a very outgoing personality and loves everyone she meets. 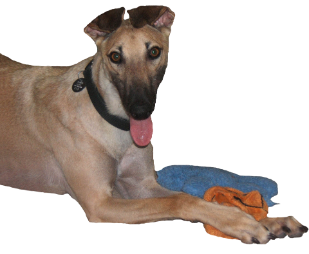 She enjoys her play time with other mid-size dogs and her greyhound brother and sisters. She loves stuffed toys and if they squeak that’s a bonus in her mind. We are working on her retrieving skills (both inside and out of the house) – inside the house she does very well, outside she wants it to be a game of “chase”. Eventually she’ll bring her baby close enough for me to toss it and the process starts all over again. Gigi is a sweetheart and with patience, love and understanding she would be a wonderful addition to your family.